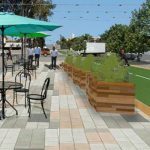 Funny thing happened on the road to drafting the final version of the Uptown Community Plan update after more than six years of work: In December, the San Diego City Council approved the ambitious Climate Action Plan, which among other things encourages density along key transportation corridors to help decrease the area’s carbon footprint. Immediately, city planners began making changes to the June 2015 public draft of the update to reflect the new CAP mandate to find solutions to reduce greenhouse gases. 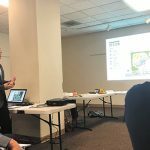 And those changes got their first public viewing on Feb. 2 in front of a standing-room-only audience at the Uptown Planners meeting at the Joyce Beers Community Center in Hillcrest, causing the crowd to murmur among themselves. 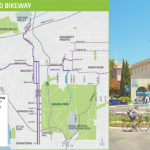 The changes would encourage higher density along major transportation corridors in Uptown, which city planners have designated as Park Boulevard, Washington Street, University Avenue, and Fourth, Fifth and Sixth streets. 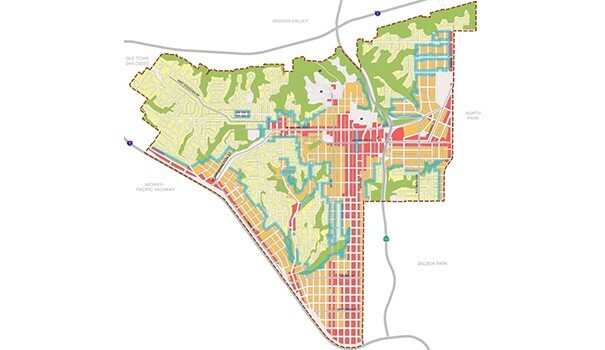 The Uptown Community Plan — which guides development in Park West, Bankers Hill, Hillcrest, Mission Hills, Medical District, Middletown and the western half of University Heights — is being updated by the city for the first time since 1988. The updated plan will have a major impact on these neighborhoods for the next 25 years. The revisions provoked emotional responses from some board members, including Roy Dahl, whose hands were shaking when he wasn’t pounding his fists on the portable table to emphasize his points. 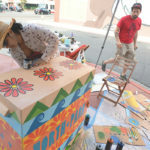 “This is a terrible plan change,” Dahl said, calling it “last minute.” He noted the stakeholders have worked many years on the update and held numerous workshops and community meetings to hear from residents, calling that exhaustive effort to be largely in vain now that city planners switched gears since December. “I feel like I’m in the twilight zone,” Dahl said, meaning that it was unclear to him what the current situation is. A couple of other Uptown Planners board members repeated Dahl’s reference to the twilight zone. Mat Wahlstrom said he wasn’t happy with the higher-density plans, and noted that a number of Hillcrest land owners and developers were in attendance. Some members of a new group calling itself the Uptown Gateway Council identified themselves during the meeting, including Sherm Harmer and Jake Schwartz, both representing the Pernicano family that owns valuable property along Sixth Avenue that has been a vacant eyesore for 30 years. Harmer has appeared before a number of community groups during the past six months, apparently trying to drum up interest in the land so the family can get their $12 million asking price. “The Pernicanos want to sell — and at the highest price,” Wahlstrom said in a thunderous voice. “It’s Economics 101.” He implied that the Uptown Gateway Council was not interested in the community’s well-being or in complying with their wishes, just focused on building skyward to maximize their profits. “What these people want is the farm and the sky and everything in between,” he said. Fellow board member Tom Mullaney, known as an anti-growth activist who faithfully trots out his homemade props to illustrate his arguments against higher density, raised a few eyebrows when he stated that he supported transit-oriented development (TOD) as well as the Climate Action Plan (CAP). “What’s wrong is the degree” of higher density, he said. “It predicts a 55 percent increase in population” in the Uptown planning district. The January update shows that Uptown’s household population would go from 36,750 currently to 55,700 at build-out. The number of housing units would go from 23,160 to 32,700 at build-out. Other board members liked what they saw in the latest draft. Board secretary Michael Brennan, one of the voices of the millennial generation on the panel, said the revision was a “huge step to the goals of the Climate Action Plan” and that the update should match up with the CAP goals. He said half of the residents of Uptown should live along the transit corridors in new developments created to encourage people not to rely on their cars but to walk, bike or use public transportation. “We need to put more money into transportation,” he said. Brennan noted that a trolley line would eventually extend from Downtown along Park Boulevard to El Cajon Boulevard and eastward to San Diego State University. He praised city planners for offering a balanced plan with priorities on TOD. “Height is a really big discussion,” Brennan said. Many Hillcrest residents are adamant about keeping the 60-foot height restriction on buildings, which is impractical for development along transit routes. “Height should be where density is; the east side of Hillcrest, for example, along Park Boulevard,” he said. Board member Chris Ward agreed that planners should put higher-density development where it needs to go: near transit corridors. Kyle Heiskala, another millennial on the board, reminded everyone that the Uptown Planners endorsed the CAP and that the update should reflect that. Before the board weighed in with their comments, audience members were allowed to speak about the Land-Use Element of the Uptown Community Plan update. The audience appeared to be divided between those who were against growth and those who were for increased density. Steven Russell of the San Diego Housing Authority urged planners to support density to bring affordable housing to an area of the city where only luxury apartments and condominiums are currently being built. Leo Wilson of Bankers Hill said he didn’t want Uptown to become University City South and urged the planners to look at other high-tech cities for inspiration. Architect Ricardo Rabines made a passionate plea for redevelopment projects that encourage walkability and sustainability. Benjamin Nicholls, executive director of the 1,200-member Hillcrest Business Association, said his members want the area to become the next Little Italy, a walkable neighborhood with great restaurants and shops. “The HBA is supportive of plans to raise the height limit,” he said. Tami Daiber, chief operations officer at Carleton Management and president of the HBA, said higher density is needed to bring housing and more people, who would support local businesses. But Ann Garwood and Nancy Moors, the Bankers Hill couple who founded the HillQuest urban guide, argued that increasing the density and raising the height limit would change the neighborhood for the worse. “Our neighborhood is being attacked by outsiders,” Moors said, citing the Gateway group by name. “They want 18- to 20-story buildings on Sixth Avenue from Robinson to Pennsylvania.” She cited all the “mom and pop” businesses and restaurants that would be displaced by such a massive project. 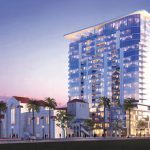 Kathleen Ferrier, with Circulate San Diego, encouraged higher density along Park Boulevard to match up with what has been tentatively approved by the North Park Planning Group. The west side of Park Boulevard is governed by Uptown Planners, while the east side is within the jurisdiction of North Park planners. Ferrier touted the success of the La Boheme housing complex in “downtown” North Park as an example of how higher density development boosts the local businesses. The meeting was adjourned after 3 hours and 38 minutes, and planners never did discuss the Urban Design Element of the update. 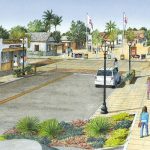 Uptown Planners have called a special meeting at 6 p.m. Feb. 16 at Balboa Park Club, located at 2144 Pan American Road West, to potentially discuss the Urban Design Element, proposed zoning changes, and the draft Environmental Impact Report. Interesting article, thank you. Very informative and lively. I do take exception with the use of phrases such as “against growth.” I know of no one against growth. I know many people, including myself, who want intelligently planned and managed growth for our community, rather than uncontrolled growth designed to make absentee investors as rich as possible. Over these many years, Hillcrest has been a wonderful place to live and shop. It is sad that the HBA (Hillcrest Business Association) is now promoting higher density and open height areas instead of supporting the “mom & pop” businesses already established which pay membership dues to their organization. There is nothing wrong with building and increasing density if we have the transportation solutions…and we do not. More buses (crowding the road further) isn’t the answer. Until you put a few trolley lines or light rail in (up 4th, 5th, 6th Aves and Park Blvd & east west corridors like Washington St, University, El Cajon and Adams)…the developers will destroy the city. Build the infrastructure first and then build the density projects. Its absurd how backwards SD is. The Uptown area was built out by the trolley line in the 1900s. PUT IT BACK! There is NO funding for a Park Blvd trolley, and just a teeny bit for a “RAPID” bus that might shave 30 seconds off your already excessively long and expensive bus trip. Why not put the density and height in the freeway transportation corridors, like I-15, where they spent all our transportation dollars? “no parking and little green space, ” – Ideally, the green space will go where the parking is now. Parking lots are a hideous blight. Do you want people, or do you want cars? Nobody is saying you can’t have parking, they’re just saying the taxpayers aren’t going to pay for your car storage. Rent a spot in a garage. 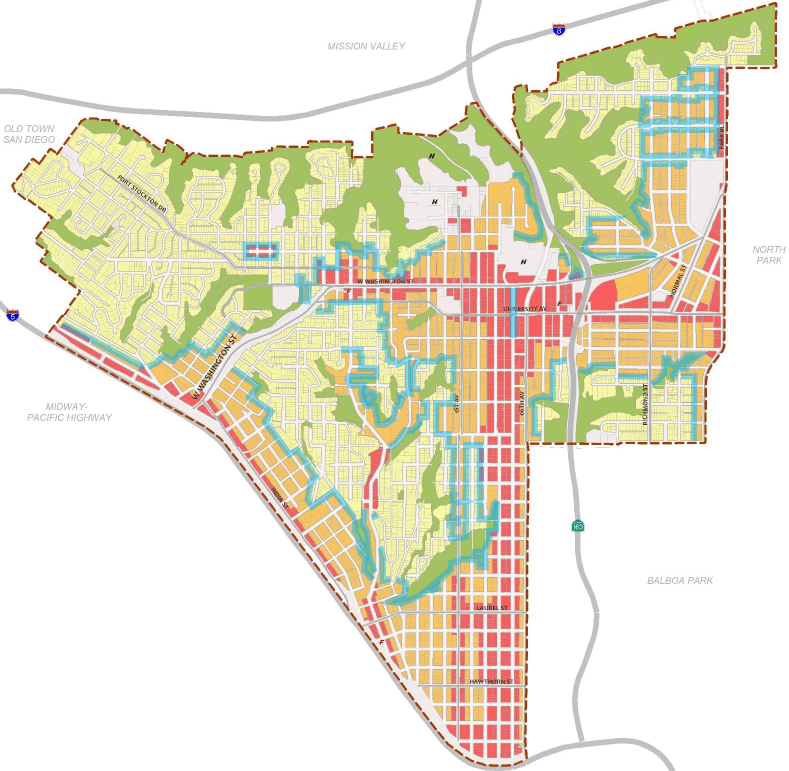 Why after 6 years of work and countless meetings has the City produced a Community Plan for Uptown that would reduce densities exactly where the City General Plan and the Climate Action Plan says we should have more housing; within walking distance of jobs, stores, and bus stops? They did it because the anti-growth activists got control of the Uptown Planners board and therefore of the Plan. None of this would matter if it weren’t for the fact that people want to live in Uptown. No one would want to build new housing in Uptown if they didn’t know they could sell or rent it quickly. The only reason to lower densities is to keep new people out. This plan won’t keep out people who can afford million dollar condos, or the homeless; it will only keep the middle and working class out. This is social class discrimination plain and simple. Want to fix the Plan and save the environment and the middle class? Attend the Uptown Planners board election March 1st and vote to change the board. After six years of hard work by informed community members, multiple meetings and workshops, input from every conceivable stake holder, the draft plan has been revamped at the last minute to satisfy the demands of outsider developers and greedy property owners. Money is the pure objective here, not the betterment of the community. To claim that this last minute doubling of height limits and densities in Hillcrest is necessary to satisfy the CAP, and that nothing has been built in ten years, is absurd and laughable. Obviously these people have not been living here, and the health of the planet is not their priority. Our streets are gridlocked now and what they are building is far from affordable. I have been commuting by bike for 37 years and it has become more and more difficult, even with improved bike lanes, because of traffic. Thousands of people are not giving up their cars. Hillcrest is and always has been dense in population. The draft plan before it was hijacked already allowed for considerable increased density and heights in a formula that would allow growth but protect the neighborhood from becoming University City. This is what our hard working planners and community members developed through this lengthy process. Why did we work this hard if it was to be thrown out to profit hugh development companies? And this money does not stay in the community. No one is trying to protect strip malls, just the sunlight on our streets, the diversity in the character of the neighborhood, the human scale. Uptown and Hillcrest are deficient in park space and have no recreation center or aquatics facility. Stuffing 20,000 more people in the area is excessive with little hope for improved infrastructure. Finally, I am really disturbed by and disappointed in this sneaky last minute revamp by our City Planners. We deserve better than this. Hillcrest is already a model of sustainable development and smart growth. It already has high density close to transit. It is the most walkable neighborhood in San Diego. It has plenty of shops and restaurants. And it is a beautiful neighborhood with lots of green space. But for some strange reason, we who live in Hillcrest are expected to give up our quality life when it is really the rest of sprawling San Diego that needs to change. We are expected to watch as our landscaping disappears and buildings are built to the lot line. We are expected to put up with even more traffic gridlock than we have now. It is not Hillcrest that needs to change, it is places like Claremont, North Park, and most of the rest of San Diego that need to change. I mention North Park, because I keep seeing letters to Uptown News criticizing Hillcrest by people who claim to live in North Park. They call Hillcrest a “dump”, and one even says that he doesn’t care what happens in Hillcrest because he’ll be sipping his craft beer in hipster North Park. North Park is a planning disaster. It is not walkable. University Avenue and El Cajon Boulevard are strip mall eyesores. Ugly six- and twelve-pack apartment buildings were shoved all through North Park between University Avenue and El Cajon Boulevard and the streets are crammed with cars. Then there is the “marvel” of 30th Street with its gentrification and eating and drinking establishments that are hip now but probably won’t be forever. All serviced by an ugly parking garage. You can put lipstick on a pig…. Transit oriented development is a nice idea, but impractical in San Diego County, which spreads over 4,200 square miles. If you live and work downtown, you can give up your car — and also limit your options. But guess what. Residential high rises downtown have parking for residents. So even high rises downtown don’t cause people to drive less. People are going to drive no matter what. Just look at San Francisco — after New York probably the most car-unfriendly city in the nation — and the streets are packed day and night with cars. Affordable housing? Show me one new housing project in the last ten years that could be considered affordable in Uptown. When you build up, prices go up as well. The price of the cheapest condo in a high rise going up on 5th Avenue in Park West is $700,000, on top of which you can expect to pay $700 or more a month in HOA dues. I guess the North Park hipsters who want Hillcrest to “build up” are trust fund babies waiting for Mommy and Daddy to leave them their inheritances. Or maybe they’re just development industry shills. It is nothing less than an outrage that the city expects Uptown to increase its population by 50% when our collapsing infrastructure doesn’t even support the population we have now. Washington Street is full of pot holes. University Avenue isn’t much better. Has San Diego updated all of its water and sewage pipes? I don’t think so. This can only happen in a town where politicians are owned lock, stock and barrel by developers. And then they have the nerve to talk about “smart growth” and preserving the environment! None of this has anything to do with the environment — it’s all about money and greed! I hope that a lawsuit is filed to force the city to upgrade its infrastructure and provide the amenities it is supposed to provide (but hasn’t) before even one more unit of housing is added. And certainly a court should order a halt to more development in San Diego until the drought ends and a water supply and storage system is developed so that we don’t go through this again in the future. Then there are the business people who want more customers. Hey, if you can’t find them here, go somewhere else. You would think that these business owners could only do business in Hillcrest. You can do business anywhere in the world. I live in Hillcrest near Bankers Hill and I won’t even walk into central Hillcrest anymore on a regular basis. It is filthy. That has nothing to do with lack of development. The same goes for developers. Go downtown! You can build high rises there. Oh, wait. What we’re really talking about here is landowners who want downtown prices for uptown land. Well, sorry. That land is not downtown, so it’s not worth the millions you are demanding. And trying to make it worth that by forcing zoning changes is nothing other than greedily demanding something that you didn’t earn and that you don’t deserve. .
Ms. Lee claims there is a “doubling of densities”, yet much of Uptown is actually being downzoned from the 1988 Community Plan: http://bit.ly/1oyFJC5. The “heart of Hillcrest” commercial area is being kept at the same density. We are already witnessing record global temperatures, massive Arctic snowpack melting and seas rising at the fastest rate in 2800 years. And Uptown residents respond by blocking San Diego’s Climate Action Plan, because of parking and traffic concerns?